Sometimes the answer is just meatballs. These vegetarian beauties, made with eggplant are tasty and perfect as a main dish paired with a salad, over pasta or even spooned over mashed potatoes or rice. They also make great game day sliders. Just add small brioche buns and extra sauce, and maybe a slice of fresh mozzarella . Or for a simple appetizer, make smaller ‘meatballs’ and serve with toothpicks. Delish! I love eggplant for it’s color, flavor and versatility. In this recipe, it doesn’t even taste like eggplant, which is a good thing because we’re making ‘meatballs’ not eggplantballs. The combination of sauteed eggplant, bread crumbs, parmesan, garlic and herbs all held together with a beaten egg is surprisingly tasty and ‘meatballish’. The texture is nice, firm but not hard or soggy. Eggplant meatballs are not going to have as much protein (or fat) as traditional meatballs but they do have quite a bit of nutrition, including protein. According to http://www.Skinnytaste.com, four of the smaller sized meatballs have 259 calories, 12 grams of fat, 9 grams of protein, 30 grams of carbs and 6 grams of fiber. Eggplant, itself, also adds some good plant based nutrients like, potassium, vitamin C, vitamin B-6, fiber and important phytonutrients. TIPS: Serve these meatbals hot right out of the pan or on a serving platter. For a main course serve with pasta, rice or mashed potatoes. For a cheesier dish, serve with a dollop of fresh riccotta. To boost the nutrition, use whole grain breadcrumbs, if you can find them or make your own. Sometimes I make my own tomato sauce and sometimes I just pick it up from the grocery store. There are many good ones availble so don’t feel like you have to make your own. If you want to try a homemade tomato sauce, I have included an easy recipe below. Since the eggplant is sauteed, you don’t have to salt it first unless you think your eggplant may be old and slightly bitter. In that case salting first, may sweeten it up. Otherwise, the cubed eggplant can go right into the saute pan. Cut eggplant into 1 inch cubes. Place 1/2 tablespoon olive oil in a large nonstick skillet over medium high heat. When hot add the eggplant and 1/4 cup water. Season with salt and pepper to taste and cook, stirring occasionally until tender, 10 to 12 minutes. If eggplant gets too dry, add a bit more water. Transfer to the bowl of a food processor and pulse a few times, but don’t puree. Transfer to a bowl and add bread crumbs, beaten egg, cheese, parsley, garlic and chopped basil into the eggplant. Season with salt and pepper. Form the eggplant mixture into balls about and transfer to an oiled baking sheet. Makes about 24 1 oz balls or 12 or more large meatballs. Bake at 375°F until firm and browned, about 20 to 25 minutes. You can broil the last five minutes for better browning, if desired. Heat the sauce in a large deep skillet to warm the sauce or make your own using the recipe below. Add the meatballs to the sauce and simmer for 5 minutes. Garnish the meatballs with basil and serve with ricotta cheese, slider buns or pasta. Saute the garlic in olive oil until it becomes fragrant. 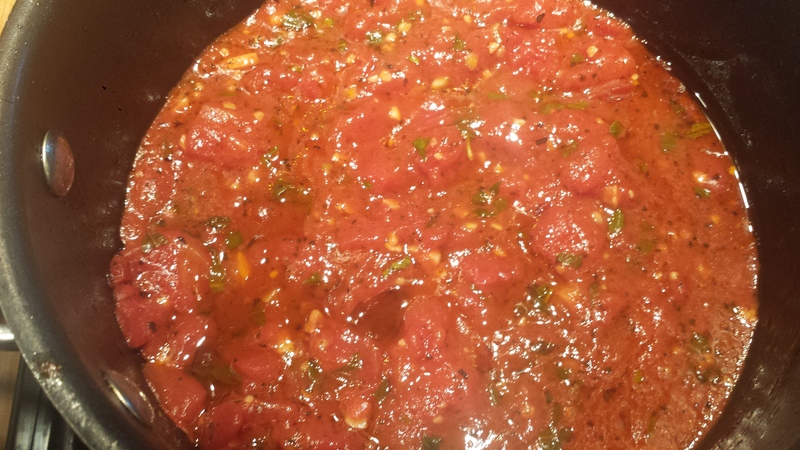 Add the tomatoes with the juice, oregano and basil and let it cook at a low simmer until it’s thickened. You can break up the tomatoes with a fork as it softens to make the mixture more sauce like. Form the eggplant mixture into balls about and transfer to the prepared baking sheet. Bake until firm and browned, about 20 to 25 minutes. Makes about 24 1 oz balls or 12 or more large meatballs. Heat the sauce in a large deep skillet to warm the sauce or make your own using the recipe below. Add the meatballs to the sauce and simmer for 5 minutes. Garnish the meatballs with basil and serve with ricotta cheese, slider buns or pasta, if desired. This entry was posted in All Recipes, Appetizers, Meatless Monday, vegetarian and tagged homemade tomato sauce, meatless meatballs, Meatless Monday, vegetarian, vegetarian eggplant meatballs, vegetarian meatball sliders, vegetarian meatballs. Bookmark the permalink.